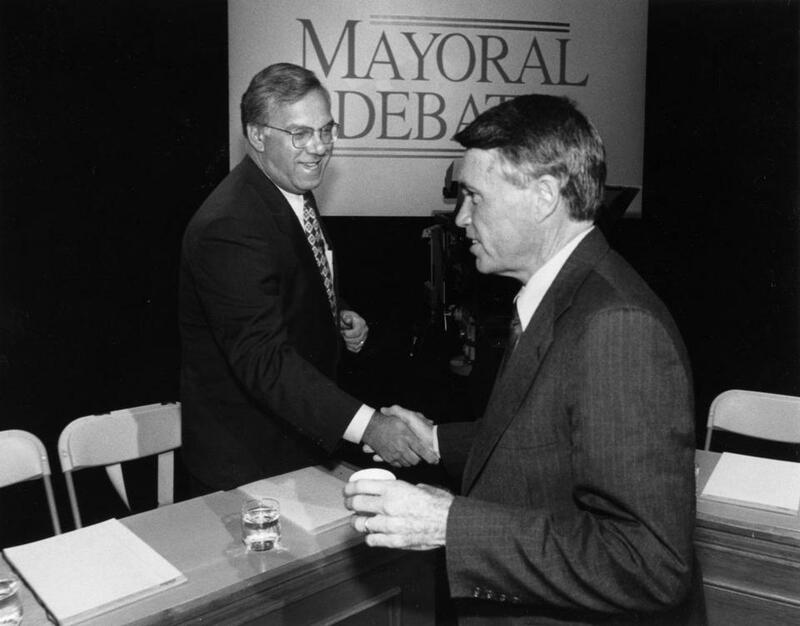 Tom Menino (left) and Mickey Roache, both then mayoral candidates, prior to a debate in September 1993. Francis M. “Mickey” Roache, a former police commissioner who had earlier helped create a first-of-its kind unit to investigate civil rights violations amid heightened racial tensions in Boston and later went on to a decades-long career in public service, died Monday after a long illness. He was 82. He was remembered by family and colleagues for his long commitment to the city and for his work as a pioneer in community-policing strategies, extending his grass-roots sidewalk-service approach to local office. “He was always in the public eye, always had the public’s interest at heart,” said Police Commissioner William Gross, who first met Mr. Roache when Gross was a cadet in 1983 and was sworn in by him two years later. Mr. Roache was first known for establishing the Community Disorders Unit in the 1970s, a time of busing and desegregation in the city. The unit would later become known as the Civil Rights Unit, and friends say the work exemplified his personality as a caregiver, always willing to help anyone in the community. Stories abound of Mr. Roache staking out a home in Hyde Park to investigate vandalism against a black family or arresting two white men who set fire to a black home in East Boston. 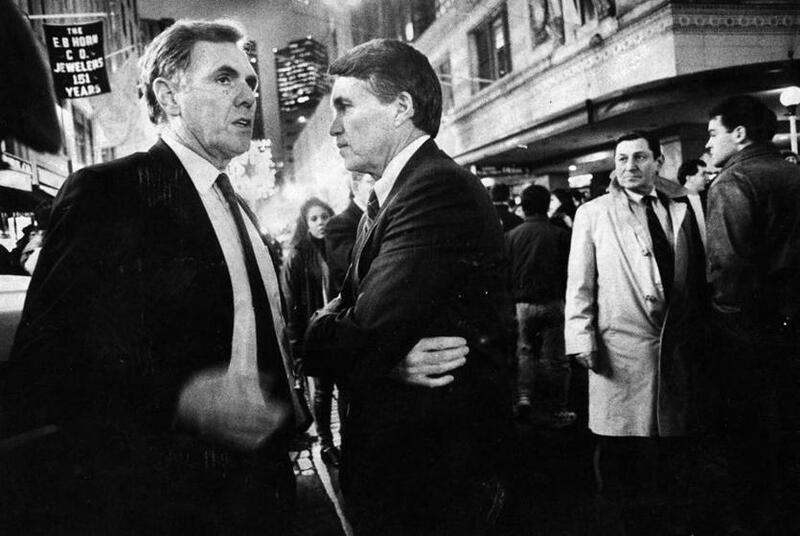 Mr. Roache conferred with Mayor Ray Flynn during a civil disturbance at Downtown Crossing in Boston on Dec. 12, 1990. Flynn and Mr. Roache were longtime friends, both sons of South Boston. Francis Roache was the oldest of four children of Barbara and Frank Roache, a longshoreman. His twin sister, Barbara Eleanor, died as an infant. A 1954 graduate of South Boston High School, he joined the Marines and was discharged in 1959. Around that time, he met his future wife, Barbara; they lived in Quincy for a time, and later in Dorchester. They raised five children: Barbara Sylva; Donna McCarthy; Paula Galizio; Michael Roache; and Lori Morrison. Mr. Roache kept close to his Roman Catholic upbringing and attended Mass daily, friends and family said, typically at St. Anthony Shrine or St. Brendan’s in Dorchester. “Instead of going to lunch, he’s out running to go to Mass,” said former police commissioner Kathleen O’Toole, who worked in Mr. Roache’s office when he was commissioner. He promoted her to detective and later to sergeant. Mr. Roache had a love of running, frequently competing in local races, including the Boston Marathon. “I was always competing with him to try to beat him, but he was a good runner,” said former commissioner William Evans. Both Evans and O’Toole praised Mr. Roache for bringing a community-policing discipline to the department, which was new at the time and met with some resistance. He used that approach in the Flynn administration, helping the mayor fulfill a campaign promise to desegregate the Charlestown housing project. Mr. Roache was also praised for working with federal authorities to root out corruption within the Police Department after his appointment in 1985. But by the end of his eight-year run as commissioner, Mr. Roache’s tenure had been briefly marred by a report issued by the St. Clair Commission, which found that he was no longer an effective manager and recommended he be replaced. He was also in charge during the botched investigation into the Carol DiMaiti Stuart murder in 1989, which led to racial unrest in the city. Police arrested a black man based on a false description by her white husband, Charles, who was later suspected in the crime. He died of suicide. O’Toole downplayed the criticism, saying it unfortunately comes with the work of being a commissioner. At the time that he resigned, in 1993, to run for mayor to succeed Flynn — who was leaving to become US ambassador to the Vatican — Mr. Roache reflected with confidence on his 25 years with the department, including as commissioner. 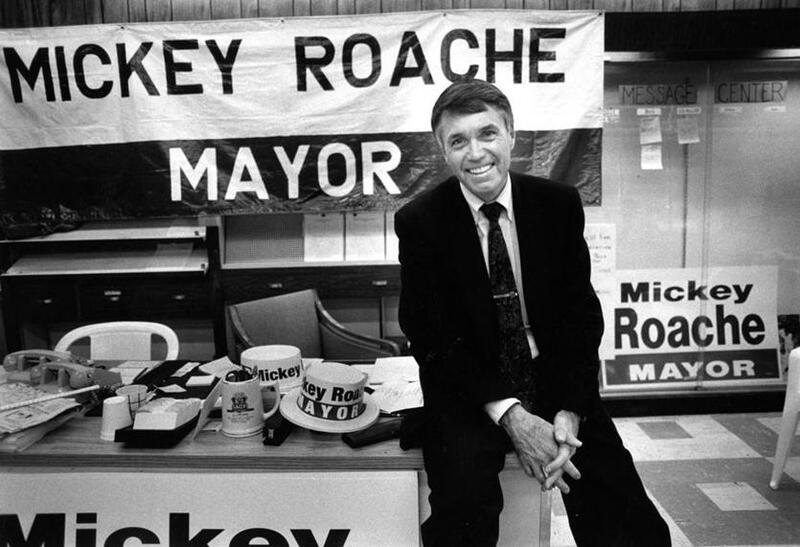 “I can look in the mirror and say that nobody owns Mickey Roache,” he told the Globe in 1993. Mr. Roache’s decision to run for mayor surprised many who knew him. They said he wasn’t the type to seek the spotlight, but he wanted to continue working in public service. William Bratton, the former police commissioner who followed Mr. Roache and who partnered with him in the 1970s in the same squad car, said that Mr. Roache’s only mistake was assuming the popularity he held as police commissioner would transcend into politics. “He felt confident in himself and his capabilities,” Bratton said. Mr. Roache only received 3 percent of the vote in the 1993 election, placing seventh in the preliminary contest. Thomas M. Menino would ultimately win the election. But Mr. Roache returned two years later, winning an at-large seat on the City Council, where he tended to neighborhood matters that ranged from street cleaning to a rodent infestation, according to Globe accounts of his work at the time. He held that post until he considered another mayoral run in 2001. He said at the time that polls showed him to be the most popular citywide elected official behind Menino, but that those same polls showed unseating the incumbent mayor would be a challenge. Instead, in 2002, Mr. Roache successfully sought the Suffolk County register of deeds post. He stepped down in 2016. His family did not disclose a cause of death but said he has suffered a lengthy illness and had been close with loved ones, including his grandchildren, since his retirement. Mr. Roache leaves his wife, his five children, and 11 grandchildren. Funeral arrangements were not yet finalized. Milton Valencia can be reached at Milton.Valencia@globe.com.